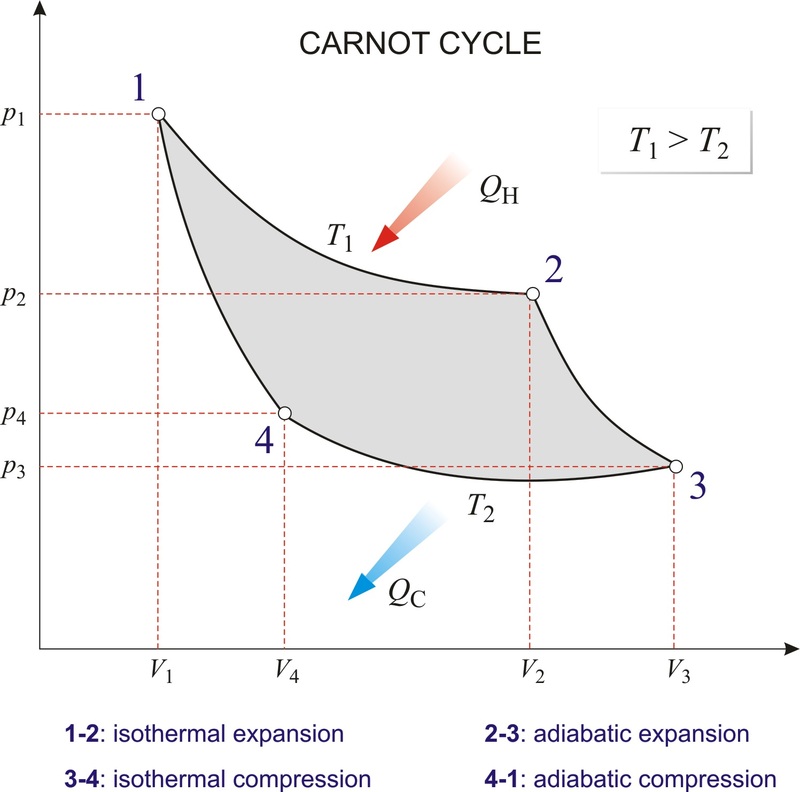 Thermal Engineering and Power Unit WHAT IS CARNOT CYCLE AND ITS EFFICIENCY? We were discussing various basic concepts of thermodynamics such as reversible and irreversible process in our previous post. We have also discussed the concept of Carnot’s theorem in our recent post. Today we will see here the very important concept of thermodynamics i.e. Carnot cycle in our thermal engineering category with the help of this post. Carnot cycle is a reversible cycle and hence it as an ideal cycle, where each process of cycle will be reversible process and Carnot cycle will have the highest efficiency and hence it is also termed as highest efficient heat engine. 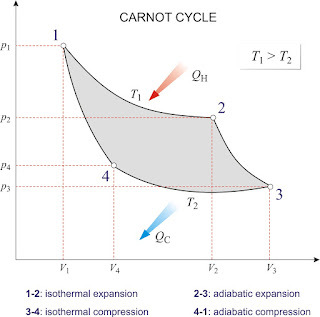 Importance of a Carnot cycle is that it will define the maximum possible efficiency of a heat engine cycle working between two temperature limits. There will not be any heat engine, which will be more efficient than the Carnot cycle working between same temperature limits. 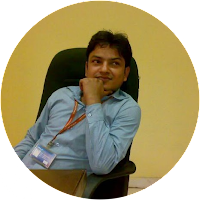 As per the principle of Carnot, efficiency of a reversible heat engine depends on the working temperature limits only i.e. temperature of heat addition and temperature of heat rejection. 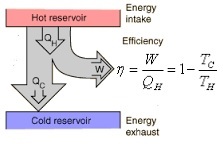 Efficiency of a reversible heat engine will never depend over the properties of the working substances. Carnot cycle will have four successive reversible processes i.e. two isothermal reversible processes and two adiabatic reversible processes as displayed in figure. Process 1 to 2 will be the isothermal expansion process. Let we have gas inside the cylinder, as displayed in figure, and we are interested to expand the gas with keeping temperature constant. As we are expanding the gas in this isothermal expansion process, pressure of gas will be reduced and volume of gas will be increased. As we know that temperature falls during expansion of gas, hence we have used one hot thermal reservoir in order to keep the temperature constant because this is an isothermal expansion process and we will have to keep temperature constant. We have noted here that during this isothermal expansion process i.e. process 1 to 2, heat QH will be added to the system, pressure will be reduced and volume will be increased but temperature will be remaining constant. Process 1 to 2, as displayed in PV diagram, will be also termed as power stroke as we will secure here the work energy due to expansion of gas. Process 2 to 3 will be the adiabatic expansion process, hence hot thermal reservoir will be removed here as we need to expand the gas at constant heat i.e. there will not be any heat interaction between system and surrounding during this expansion process. We have noted here that during this adiabatic expansion process i.e. process 2 to 3, pressure and temperature will be reduced and volume will be increased but there will not be any heat interaction between system and surrounding during this expansion process. We must note it here that during process 1 to 2 and process 2 to 3, system has done the work over the surrounding or in simple words we are securing work energy during these two processes. Process 3 to 4 will be the isothermal compression process. 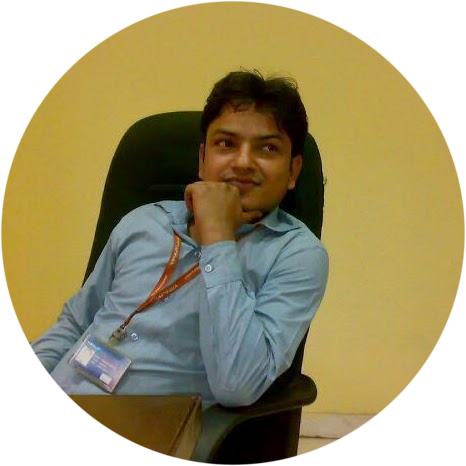 As system will have to secure its original state in order to complete the cycle and therefore we are interested to compress the gas with keeping temperature constant. As we are compressing the gas in this isothermal compression process, pressure of gas will be increased and volume of gas will be reduced. As we know that during compression of the gas, temperature of the gas will be increased but as we need to keep the temperature constant and therefore we will use one cold thermal reservoir so that heat will be rejected to cold thermal reservoir and temperature of the system i.e. gas will remain constant. We have noted here that during this isothermal compression process i.e. process 3 to 4, heat QC will be rejected to the surrounding i.e. cold thermal reservoir, pressure will be increased and volume will be decreased but temperature will be remaining constant. Process 4 to 1 will be the adiabatic compression process, hence cold thermal reservoir will be removed here as we need to compress the gas at constant heat i.e. there will not be any heat interaction between system and surrounding during this compression process. We have noted here that during this adiabatic compression process i.e. process 4 to 1, pressure and temperature will be increased and volume will be reduced but there will not be any heat interaction between system and surrounding during this compression process. We must note it here that during the process 3 to 4 and process 4 to 1, work will be done over the system by the surrounding. We have secured one reversible cycle i.e. 1-2-3-4-1 and this reversible cycle will be termed as Carnot cycle.